With a dramatic increase in wildfires, flooding and drought, cities need to adapt their approaches to water management. The World Economic Forum ranked water crises as the top global risk of highest concern for the next ten years. As extreme weather and urbanization continue, the world must adjust to a ‘new normal.’ At Canadian Water Network, we believe Canada has the potential to be a global leader in water management and innovation. Replacing aging water infrastructure has become a critical issue in Canada. Ensuring that systems are reliable and affordable in Canada’s cities over the next decade will not be an easy task, but Canadian Water Network and its municipal leadership group are up to the challenge. 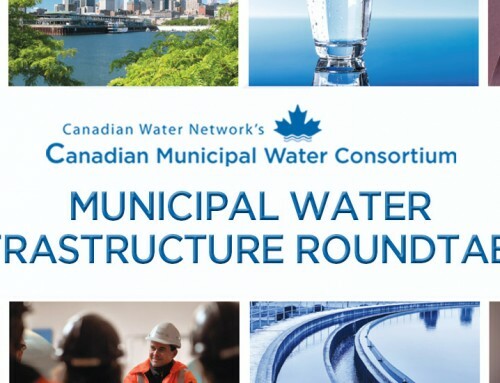 Senior federal and provincial representatives, as well as municipal water executives from 19 cities, will be attending the first-ever Municipal Water Infrastructure Roundtable on May 17. Canadian Water Network, in collaboration with Infrastructure Canada, will be engaging these leaders to discuss the most effective ways to fund and rebuild Canada’s aging water infrastructure. Over 150 change makers and senior leaders in water management are attending the Blue Cities conference on May 18-19. This two-day event is focused on finding solutions to water management challenges and identifying opportunities for innovation in order to increase resiliency in Canadian cities. “Blue Cities is about getting the right people in the room together to have strategic conversations about municipal water issues. Our cities are looking for innovative ways to make their water systems more resilient and financially sustainable. Innovation, big data, collaboration… these concepts will be key when we’re looking at the impacts of climate change, or extreme events like flooding or fire,” says Bernadette Conant, CEO of Canadian Water Network. Impacts and Risk Identification for the New Normal: Extreme weather and unforeseen events impact public, environmental and economic health. How should we prepare? The Business of Getting to Sustainable Systems: What are the best ways to maximize taxpayers’ investments to achieve the goals of sustainability and resilience? Infrastructure and Planning Approaches for More Resilient Systems: How can we ensure a strong future for our communities as we deal with the challenges of crumbling infrastructure and rapid urbanization? Communications: Public Concerns, Facts and Tough Decisions: Water managers are often faced with making tough decisions that are not always popular with the public. How can we connect science and decisions to what matters to the public? As Canada’s premier water knowledge mobilization organization, we put research into the hands of decision makers. We focus on understanding government and industry priorities and ensuring that water research and innovation can support them. Over the past 15 years, our work has protected public health and saved taxpayers hundreds of millions of dollars. The Federal Budget has committed to funding $20-billion in green infrastructure initiatives over the next ten years. In conjunction with 44 universities across Canada, Canadian Water Network has conducted research on water management. The cost of infrastructure needing repair or replacement for drinking water, wastewater and stormwater systems is estimated at over $170 billion. 54% of stormwater infrastructure is in fair to very poor condition, while 35% of wastewater infrastructure and 29% of drinking water infrastructure is in fair to very poor condition. Only 1 in 10 Canadians think water systems in their community require major investment. 46% of Canadians have no knowledge about the condition of water treatment systems. 50% of Canadians have no knowledge about the condition of stormwater systems. Over 30% of Canadians have been impacted by flooding due to extreme weather in their communities.